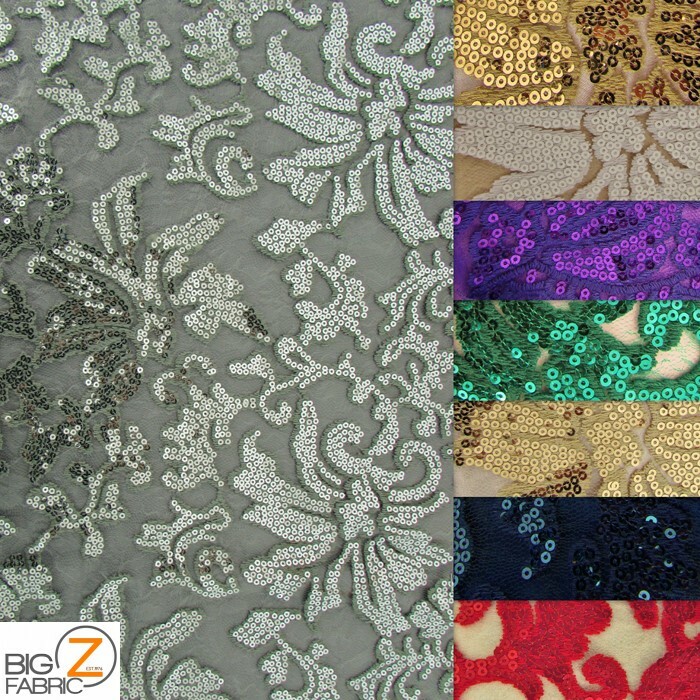 In the old days, one of the most expensive fabrics was lace, and that was because it simply took so long to make. Weaving looms were quicker and easier, so solid textiles were far cheaper, while a good lace pattern took dedication, patience and focus. And time, the singular ingredient no amount of shortcuts could fix. Lace took time. Machine lace rapidly overtook its handcrafted counterpart in the 19th century however, dropping the prices of good lace significantly, and since then humanity has gone out of the way to make it more and more beautiful. This flower lace is augmented with sparkling sequins and done in rolls no less than 56 inches across, selling for $21.99 a yard in thirteen different colors. The pattern is fairly decent sized, neither overly large or too small, and will work best when lain over another fabric as it is rather transparent aside from flowers. There is a small bit of stretching, but although it is rather easy to sew, lace can be fragile and shouldn’t be pulled beyond limitation. This could be used to pattern a gown or as an accent for another project, provided that project keeps the lace limitations in mind. Damask is the term given to woven fabric with a pattern visible on both sides, such as the Renaissance inspired designs on this elastic mesh. The edges are finished with a final width of 54 to 59 inches, and the pattern is done with circular sequins to stand out in every circumstance. The fabric comes in sixteen different colors to match a unique vision, and with a price tag of $28.99 for single shades and $33.99 for multiple colors, it’s not a bad buy for the extra spellbinding effect. As the pattern is quite large, smaller pieces might not get the full effect of it, but it could be used as an elegant table runner or interior curtains, or even pinned up on the wall for decoration. The mesh has decent transparency and will permit whatever color is behind it to come through whenever it’s used as an accent. For costuming, one could used it for brilliant sleeves, trains or veils, or attach it to plain clothes to give them new style. Applying this cloth to dresses would make a bold statement on the floor, whether it’s applied to a ballgown or a dancing dress, like the returning flapper gowns. 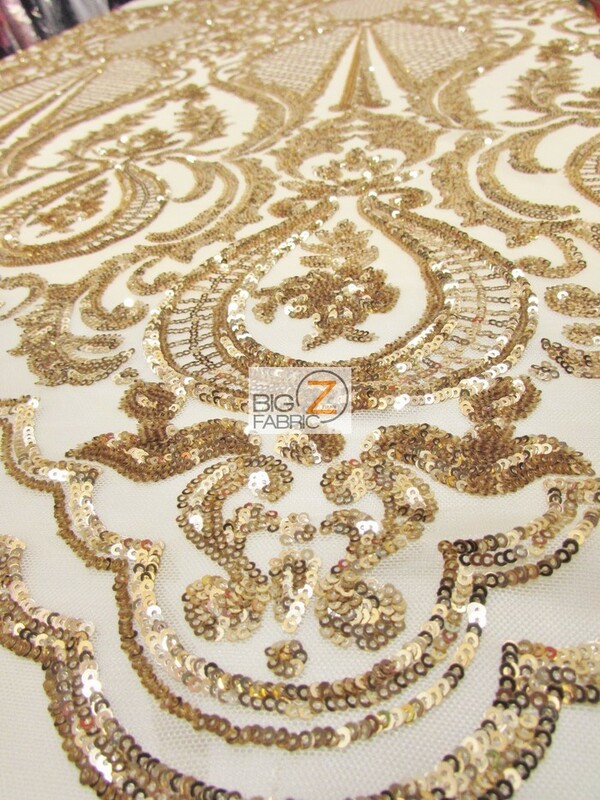 Sequins fabric is a beautiful polyester fabric covered in ⅜” sequin pieces. The fabric is 55” wide and sold in continuous yards. 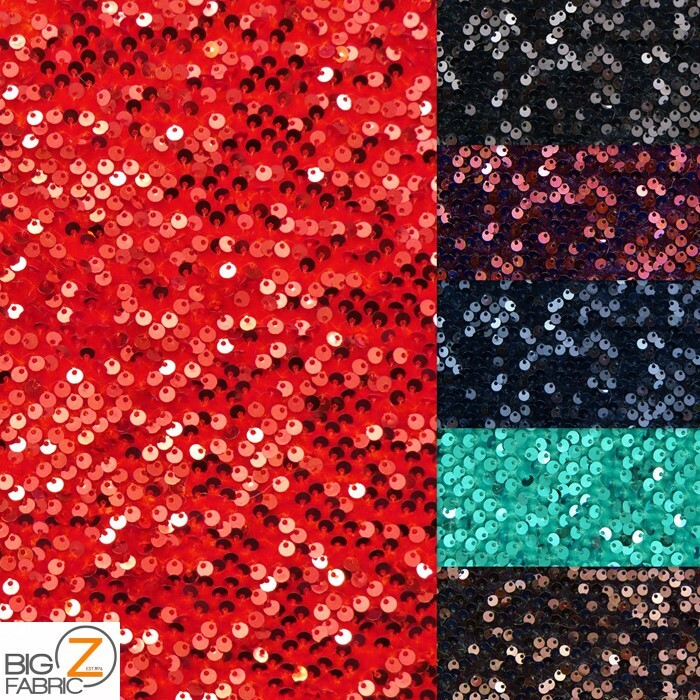 Sequins fabric is $10.99 a yard and available in six different colors including silver, turquoise, white, red, green, and fuchsia. If you would like to try the sequins fabric without purchasing an entire yard then you can always request a sample of any color for only $1. Sequins fabric is great for making arts and crafts such as decorative pillows, tissue box covers, or even for making stylish clothes. Crafting ideas include making sensory bracelets, reversible corkboards, or Christmas tree decorations. You can dress up hair barrettes and headbands by covering the plain band with sequin fabric for added pizzazz then using fabric glue to hold it in place. Another decorative idea is to line the outside of a plain picture frame with sequins fabric to spice up the frame. Sequin fabric is easy to work with and versatile for creating a variety of decorating and crafting ideas.